Vicki Abeles, producer of the film Race to Nowhere is asking for innovative educators to take a minute or two to tell your story in front of a camera. 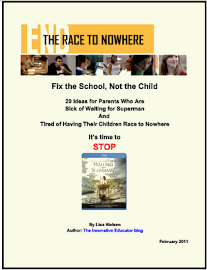 Please share what actions -- big or small -- you, your family, or your school taken to break out of the “Race to Nowhere." Think about the small steps you've taken. Did you sign a petition, ask for homework-free holiday breaks in your school, speak to a teacher or administrator about homework, testing or the school schedule? Did you make changes in your home, change the conversation with your family and friends, attend a school board meeting or advocate for more time for recess? Did you make changes to support more balance or time together as a family? Maybe you're thinking ahead to the actions you will take in 2013 to support the growing movement. What are you willing to commit to do to be part of the change you believe is needed? For example, homework is an often-discussed issue -- are you planning to form alliances with others in your district? Start a task force? Write a letter to the National PTA? Share at least one concrete action you can take in your home or school that would make for a happier, healthier, more balanced family and childhood? How might you bring others into the conversation? Remember one person's actions can have a ripple effect, and our collective actions have the power to change our education system and our culture. Here is my video which features the Fix the School, Not the Child eBook I was inspired to write after watching the film, followed by some tips to create your own video. But hurry. Abeles wants your videos today. That means really today. So do it right now or when you get home from work make yours! Personalize the statement: “Race to Nowhere inspired me to _______.” or "In 2013, I plan to _____________ to break out of the Race to Nowhere." or "My greatest hope for the future of education is ____________." Sum up your action in a sentence or two. Tell us what inspired you and share the impact of your action. What are your plans going forward? What are your hopes for the future? Choose a quiet, well lit spot to record. Natural light works best. Place your recording device on a stable surface (or use a tripod). If you're using a smart phone, shoot horizontally for a more standard aspect ratio for your video and better sound. Consider asking a friend to hold the camera and interview you. It's easier to share your story with a friend or family member. Use this flyer to share actions taken and hold it up when taking your photo or recording your video. You can use your smartphone, computer camera or digital camera and save the video as a Quicktime .mov file.